The Lone Pipit, or, Who Was That Brown Bird? | Great Auk - or Greatest Auk? The Lone Pipit, or, Who Was That Brown Bird? On Sunday, I saw an American Pipit. Or a Buff-bellied Pipit, of the American subspecies. Or a Water Pipit, sort of. Normally, a series of caveats like that would keep a bird off a gal’s life list, but in this instance I definitely saw Anthus rubescens so it’s all good. Back in the misty days of yore, when I bought the now-battered field guide that actually accompanies me to the field, there was only Anthus spinoletta, the Water Pipit. Its range was “Colder parts of N. Hemisphere. Winters to Cen. Ameria, n. Africa, s. Asia.” Like many birds with such vast ranges, it had a number of subspecies (seven, according to most of the authorities I can find), and these subspecies patronized different habitats and showed morphological differences sufficient for some ornithologists to advocate dividing the species into at least two as early as the 1950s. By 1989, the AOU was on board with a 3-way split, with a group of birds that favored wet European and southern Asian lowlands getting custody rights to both the common and the Latin name. 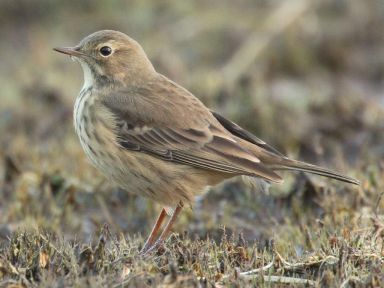 Populations living on the rocky coasts of Britain and Europe were given the name Rock Pipit Anthus petrosus, and American birds, along with those from eastern Asia, were dubbed Buff-bellied Pipit Anthus rubescens. It is believed (although not conclusively proved) that A. r. rubescens is the subspecies most likely to be found in the eastern U.S. in winter. Typically they band together in flocks outside the breeding season, but the individual in Prospect Park didn’t know that, or perhaps s/he was merely suffering from an identity crisis of some kind. Although, really, it’s hard to imagine anything mattering less to a bird than what we call it in Latin. So it’s more likely that this bird was lost, separated from a larger group by mischance, bad weather, some slight injury – who knows? At any rate, it found a place on the Long Meadow where fences keep human and canine alike off the newly reseeded lawn, and there it has stayed for the past two weeks. It walks alone, nearly invisible despite the short grass unless you know what you are looking for, streaked and gray-brown against a streaked gray-brown palette of earth and grass. It picks winterized insects and grass seeds from the dirt one at a time, pausing between each to eye the observer suspiciously. All descriptions of the species say that it bobs its tail, but this hardly does the motion justice – its entire rump moves up and down continually. It was nearly the only species I spotted in Prospect Park last Sunday, with less than an hour to spend – Robins and Blue Jays and Rock Pigeons and House Sparrows and a single Ring-billed Gull were its list companions – but as you can see, it contains legions. I don’t think I’ve seen more than one or two pipits at a time. They must get the reputation for flocking from more rural areas. Pipit? I barely knew it! I’ve seen flocks of Pipits in fields in rural areas out of town. The vast fallow cotton and tobacco fields in the eastern part of North Carolina are full of them. They also really like muddy areas where cattle congregate. Neither are places I suppose you can easily find in NY and NJ. There are rural fields in both states, just not in the New York metropolitan area. If I lived in southern New Jersey I might see flocks more often. Oddly, I never saw pipits at The Olde Homestead either, but perhaps the usual degree of snow cover was just too much for them. And of course I didn’t do as much winter birding back then as I do now. This blog post, right there, is EXACTLY why I love, love, love pipits. Do you think we could generate grants for a long-term study to test how many of the world’s 10,000 bird species can be turned pink by feeding them shrimps? Possibly the shrimp industry would be interested.